Giving Beautiful Fresh Flowers Will Fill Her Day with Sunshine and Love. 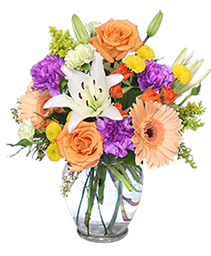 To Send a Floral Arrangement in the Coral Springs, FL area, Call DARBY'S FLORIST Direct or Order Flowers Now from our Website. Say Thank You...Happy Birthday...Congrats...or Thinking of You... with this BRILLIANT BASKET of fresh flowers from DARBY'S FLORIST. Call direct or order flowers online today! Show how much you love and appreciate them with this colorful gift of flowers. It's sure to brighten the day, as well as their home or office. Call DARBY'S FLORIST or order flowers now for someone who means the world to you! Sending flowers but having trouble deciding on the perfect arrangement? Best Sellers are a great choice for you. No matter what the occasion or who you are sending to, let DARBY'S FLORIST help you find what you're looking for in the Best Sellers section. Call or click today!